LET'S GET IT ON, KEEP GETTIN' IT ON and IF I SHOULD DIE TONIGHT: Basic tracks and demo vocals recorded at Motown Studios-Hitsville West, Hollywood on March 13, 1973. 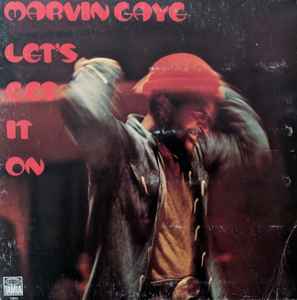 Overdubs for LET'S GET IT ON recorded March 22 (final lead vocal) and April 4, 1973 (background vocals). Engineers: William McMeekin & Art Stewart. PLEASE STAY (ONCE YOU GO AWAY) recorded June 15 (track) and July 26, 1973 (vocals). Engineer: Cal Harris. DISTANT LOVER: Basic tracks recorded at Hitsville, Detroit, November 3, 1970; various vocal parts and additional instrumentation overdubbed in Detroit, November 4, 6, 20, 24, 25 and 30, December 5, 13 and 20, 1970 and January 21 and 27, March 10-13 and April 10 and 11, 1972. Engineers: Steve Smith and Cal Harris. L.A. overdubs recorded at Motown Studios-Hitsville West, April 27 (guitar, piano, MOOG and background vocals) and July 6 (saxophones) and 20, 1973 (kick drum). Engineers: Larry Miles and Cal Harris. YOU SURE LOVE TO BALL: Basic tracks recorded at Motown Studios-Hitsville West, Hollywood, February 1, 1973. Overdubs recorded February 8 (strings and brass), July 6 (saxophones), July 9 (background vocals) and July 26, 1973 (lead and background vocals). Engineers: Larry Miles and Cal Harris. JUST TO KEEP YOU SATISFIED: Basic tracks recorded at Hitsville, Detroit, MI, June 1, 1970, assigned to the Originals. Various overdubs recorded at Hitsville and Golden World, Detroit, August 28, September 1, 4, 12 and 21, November 10 and 20, 1970 and March 22, 1972. Engineers probably Steve Smith and Cal Harris. L.A. overdubs for Marvin Gaye recorded at Motown Studios-Hitsville West, July 5 (saxophones), July 12 (background vocals) and July 16 (lead and background vocals). Engineers: Larry Miles and Cal Harris. VIP-25 is a reissue of this album released in 1985, not in 1973. Good quality pressing. As far as the sound quality, I’m very happy with the copy. Great repress. Sounds fantastic. Glad I picked it up. My copy of this pressing sounds very good. it's had Botox compared to the Gavin Lurssen mix I have on CD but that always felt a bit lackluster to me. As mentioned below the bass has been pushed and the whole thing sounds very alive. Also worth noting that this is the best colour from a coloured vinyl I've seen. My pressing is flat and centered and quiet. Who cut and pressed this RSD re-issue? Deadwax information? Thank you! When I saw the price of this single LP reissue, I was a little pissed...$32! I rarely ever pay over $25 for a single LP. But! I have to say this LP delivers! First thing that hits you is that deep, warm bass, it really rounds out the sound and the music sounds super full and lively. Drums are punchy, and Gaye's vocals are sharp and dynamic. The sound is up front and direct and you can really feel the emotional energy in the tunes. I'm super happy with this reissue to where I don't really care that it cost an arm and a leg, it's totally worth it. Amazing clarity, nice, rich sound. Pressing is ace too, flat, centered and not a lick of surface noise. 10/10. Pick this up if you can. Song #3, Where Are We Going? (Alternate Mix), so many highlights. Any variation of this Deluxe Edition is an absolute must-have. Can anyone verify the quality of the vinyl in this edition? Is it thick enough, etc?